Is Retaining Your Top Talent an Organizational Priority? 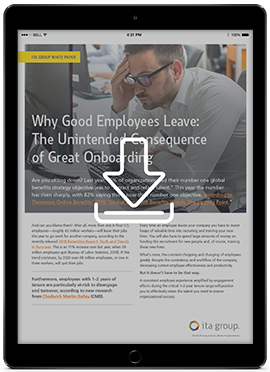 Our white paper “Why Good Employees Leave: The Unintended Consequence of Great Onboarding” will help you more effectively engage and retain employees for the long-term with recommendations for changes you can make today. Employees have different needs (and expectations) at each stage of the employment journey, so a one-size-fits-all approach will likely miss the mark. What does your strategy look like? Absolutely. We know a lot about our industry and we like to share. After all, we're in the business of helping people succeed, and it's our pleasure to offer our expertise. Keep us in mind next time you need an employee experience solution.